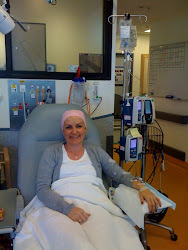 Learning How to Dance in the Rain ....: Yabadabadoo - bye bye chemo bye bye!!!!!!!! Well tonight the reality of not having to do chemo again is beginning to hit and it feels gooood!!!!! Yesterday was long and painful as expected - the minutes seem as hours and unfortunately every thought is for that day to be over!! I had to keep telling myself that this is the last one!! Along with the physical struggle comes an emotional one each time - and even though you know its coming it doesn't make it an easier! My poor mum had to witness it all this time - her gentle care brought me to tears! I have been so focussed on getting through but having her here at home with us in the worst bits looking after us - just reminded me how vulnerable it all makes you and how thankful I am for her support! The weather has taken a turn - heavy rain and strong winds so bed isn't such a bad place to be - although when you are forced to be there its not always where you want to be!! I find my mind full of contemplating on these days and more than ever realise that we really cannot control what life deals us but we can control how we deal with life!! This is certainly the greatest challenge as sometimes we would prefer a different hand - but nevertheless we have to face the hand we are dealt!! So the longest day came to an end and today I feel like the chemo cloud is lifting once more. I cannot relay how amazing that feeling is - even though as usual there will be other side effects to face in the days ahead - nothing is like the dark tunnel and slippy slope to yesterday!!! So mum and I had a rather relaxing day - a lovely friend braved the wind and rain to drop off a meal for us on the way to school - I was in bed most of the morning and only ventured out later to watch a bit of tv. Mum was going to drive to school to get the girls but my car battery decided to die so our faithful friend B came to the rescue. She lives a bit away from us but has been so amazing in wanting to help me and the family - taking the girls each week to do a grocery shop amongst other things - I shall be eternally grateful for her willingness to be there for us!! And so before long, today too has passed!! Not to wish ones life away - as I now know more than ever to make the most of what we have been given but I am so glad that these last few days are behind me now and I look forward to feeling a bit better in the days ahead!! I can now sing in a loud voice - Bye bye chemo bye bye !!!!! What a great song !!!!!!! The words of WB Yeats have been echoing in my head so thought I'd share with you.